These tools are designed for anyone who is engaged in microscope work, miniature applications as well as specimen manipulation. Micro-Tools are the smallest known precision tools available for the laboratory and micro electronics industry. Micro-Tools are available in 32 different tip configurations with interchangeable handles. Micro-Tool consists of a threaded handle (MT1), and an interchangeable threaded base with tool tip. Tip material is hardened tool steel unless otherwise noted. A special Minitool Laboratory set 6X contains all 32 standard micro-tools (0.5 mm (0.020") nominal diameter) as well as other sizes (0.25 mm or 0.12 mm nominal diameters), 6 interchangeable MT-1 handles and one tool sharpening stone. Each set comes with a hand-milled finished case made from solid walnut. For safety and convenience, micro-tools are placed into individual "PTFE" bushings in a pivoted tool rack, which automatically swings into position when the lid is opened and retracts when closed. Six tool handles are rested in milled cavities. All standard micro-tools (0.50 mm nominal diameter) as well as other sizes, 0.25 mm or 0.12 mm, can be selectively ordered to make up a set of your choice. Simply select the tools you desire, add the alderwood case (if the number of tools are equal or less than 8 tools) or solid walnut case (if the number of tools are more than 8 and up to 32). If you chose the 0.25 mm diameter, tools will be shipped in a special single tool container along with a storage case and handle. A solid walnut hand-milled finished case . Designed to store 32 tools and 6 handles. Designed to hold 8 or less micro-tools and one MT handle. All tools are forged from the finest quality stainless steel and are precision hand ground, lapped, and polished. These tools are well suited for most applications in the field of microscopic science which demands the ultimate in precision miniature tools. Each tool may be ordered separately or in a set consisting of all 8 tools with mounted tips, one MT handle and one alderwood storage case. 62096-02 Micro-Needle, bent 45 degree. 62096-03 Micro-Needle, bent 90 degree. 62096-08 Micro-Ruler. Precision etched stainless steel with 0.5 mm handle. Available in metric or english. Instrument Case for stainless steel tools, made from alderwood. Can store up to 8 tools and one handle. Stainless Steel Micro-Tool Handle, Made from stainless steel, 120 mm long, for use with above tools. 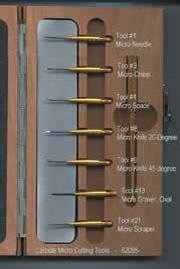 These unique micro cutting tools are made using the latest grinding and polishing technology producing the highest quality tool on the market today. Tools are available in solid carbide with the following tip sizes: 0.12 mm (0.005"), 0.25 mm (0.010"), 0.5 mm (0.020"), and 1 mm (0.040") diameter. Tool handles are inter-changeable in tool handle MT1. Each of the tool tips and handle can be ordered separately or in sets. 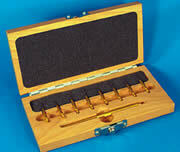 Standard sets come with hardwood instrument cases and include seven tool tips (no tool #2) and one handle MT1. Each set comes with a MT-1 Handle, instrument case, and 7 tips listed above (no tool #2). 5 piece set includes scriber, chisel, knife, triangular scraper and oval graver - each razor sharp. Hexagonal anodized aluminum handles, 140 mm (5.5") long. Hardened tool steel tips, 1.5 mm (1/16") diameter, are easily sharpened or pointed. Comes with a protective plastic case. 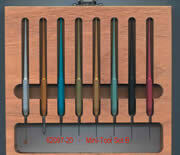 Contains eight tool tips with integrated, color-coded handles which are light-weight, non rolling and well balanced. Overall tool length is approximately 127 mm (5"). Tip size is 0.8 mm (.030"). Tip material is hardened tool steel, nickel plated. Set contains: Straight Micro-Prober, 30° Micro-Prober, 90° Micro-Prober, Micro-Chisel, Micro-Knife, Micro-Graver, Micro-Diamond Scriber and, Micro-Measuring Scale. See Tools: Calipers, Spatulas, Screwdrivers, and more in Chapter 15.